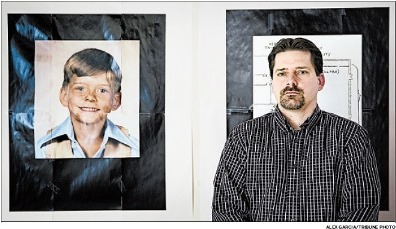 A large selection of Joliet diocesan files regarding the sexual abuse of children by priests, and the mishandling of those crimes by the diocese, was released by abuse survivor David Rudofski and his advocates on April 30, 2014. The release was the latest step in a dramatic story that dates back to the early days of the diocese, which was erected in 1948 from the Chicago archdiocese and the dioceses of Peoria and Rockford. The documents, which are provided in their entirety below in optimized, easy-to-download form, have much to tell us about the horrifying details of individual cases and the methods used by the Catholic hierarchy to protect the priests involved while containing the information about their crimes. Rudofski’s struggle to make the documents public highlights the foundational role played by survivors in the somewhat greater accountability we see today, and makes clear what is driving that accountability. The document release also sheds light on the generally still poor state of accountability post-Dallas, owing to the weaknesses of the Norms as revised by the Vatican and the failure to implement the aspirational language of the Charter. The Rudofski Archive argues for an increased commitment by the bishops to list their accused and make public the voluminous files that the dioceses and religious orders hold. David Rudofski was sexually assaulted by the Rev. James Burnett at his First Confession in 1982 at St. Mary’s church in Mokena, Illinois. His molestation was a crime, and because it was perpetrated during confession, it was one of the gravest offenses a priest can commit under the Catholic church’s own Code. Yet the file demonstrates the way in which a priest such as Burnett, who is accused by three persons, two of whom were abused in the confessional, can be effectively shielded by the framework established by the U.S. bishops in Dallas in 2002. What the bishops did not anticipate in Dallas was that the survivors of clergy abuse would take the bishops’ commitment to transparency and responsibility much more seriously than the bishops themselves. Rudofski refused to settle with the Diocese of Joliet without the release of the files for all the accused priests whose cases were mishandled during the same time that Burnett was abusing Rudofski and Dan Shanahan (the survivor who first went public about Burnett's abuse). Rudofski was supported by his attorney Terrence Johnson, and after a protracted and costly legal battle, Rudofski prevailed, by order of Will County Circuit Court Judge Michael J. Powers. The results of Rudofski’s determination are available below, as well as on the websites of attorneys Jeff Anderson and Marc Pearlman. Anderson had taken the deposition of Bishop Joseph Imesch of Joliet in 2005, another benchmark in accountability within the diocese. Imesch’s mishandling of four cases, including the Gibbs and Lenczycki abuses documented below, had earned him the dubious honor of inclusion in the Dallas Morning News’ database of enabling bishops. That article was on the newsstands when the bishops gathered in Dallas. Below we provide the local news coverage that unfolded in Joliet at the same time that the story was breaking in Boston, as the highly local abuse crisis, which occurred parish-by-parish and home-by-home, became a national and global concern. In 2013, when Rudofski settled and obtained the files he sought, Bishop Conlon of Joliet belatedly added six priests to the diocese’s list of priests credibly accused of sexually abusing children, including Rev. James Burnett. (Compare Joliet's March 22, 2012 list and its March 12, 2013 list.) Hence Rudofski’s became an important reminder that we know the names of 3,500 accused priests, nuns, and brothers in the U.S. because of the survivors who have been willing to come forward. But by the USCCB’s own admission, the bishops know the names of over 6,200 offending priests. The reason for the gap between those two numbers was illustrated by Bishop Conlon’s late additions to his list of offenders – priests whose misdeeds were well documented in the diocese’s own files. A portion of those files is now available, thanks to the work of David Rudofski and the people who supported his quest. Note: Refresh this page frequently to see more individual documents that we have selected from the large files. In order to process the files for release, the Diocese of Joliet applied red labels and Bates numbers at the top of each page, and then certain documents were removed in negotiations between the diocese and Rudofski's attorney. Documents from the files of 15 priests are included in this release. In addition, documents and articles relating to Rev. James Janssen, of the Diocese of Davenport, were posted by Jeff Anderson and Marc Pearlman, because Janssen worked briefly in the Joliet diocese. The Janssen materials were obtained from BishopAccountability.org, not from the Diocese of Joliet. In addition to the 15 Joliet priest files, the Joliet diocese released miscellaneous documents from the files of Bishop Imesch, Sister Judith Davies, the diocesan investigators, and the diocesan staff responsible for counseling and pastoral assistance. These miscellaneous files were provided by attorney Terrence Johnson in two large PDFs. We separated these files into their four categories, using the red Bates labels at the top of each page. To show the original source of those groups of files, and to confirm to the user that the miscellaneous files are published here exactly as they were released, we provide the two original PDFs, as well as the four categories of PDFs. We have processed all the files on this page to make them searchable, and optimized them to make them easier to download. We have used Adobe Acrobat tools to do this work, and have not altered the look, feel, or content of these files in any way.